I waffle back and forth on lanyards. On the one hand, they’re incredibly handy when you’re guiding (or pseudo-guiding, a situation I find myself in all too often). On the other hand, they tend to tangle, they rattle, they get hung in brush or hair, and they have just a whiff of pretension to guide status. Lanyards are also frequently overkill. 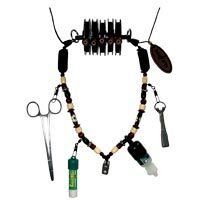 Most of us can make do with a couple spools of tippet, a pair of pliers or hemostats, and a nipper. For certain special situations, we might want to throw a wheel of split shot or some dry fly dope into the kit, but we rarely need both on the same day. I’ve yet to find the perfect lanyard, but you can’t go far wrong with Mayfly‘s excellent models, which are made of coated wire (so they stay splayed out), and which have a pad for your neck. My Mayfly (a Christmas present), usually has a couple unused hooks, but I put them to good use by catching a tippet spool horizontally above the rest of my gear (they now make a model with this feature built in – pictured). For grab-and-go angling, it’s really the simplest method possible, and it’s definitely handy when working with people who tend to tangle or lose flies frequently. Let us know your thoughts on lanyards generally–or special ways you’ve tricked them out–in the Comments section! Stripping Baskets: What Are They Good For?